Should we let those scientists fight it out over rock/paper/scissors? Or how do we resolve this conflict? Are you fit enough on the topic to find out why both came to different conclusions? No we don’t have too resolve this conflict, the ‘science’ of climate and how it changes is not settled. The evidence for atmospheric CO2 warming has not be shown by observed evidence, so all mitigation measures for it should be scrapped until it is ‘prove’ to be happening. Until then it’s just a supposition and a dream for climate modelers. And the models they have build (with except to Russian model) do little to reflect this planet’s observed reality. There is no evidence of a threat of global warming or any unusual climate change what so ever. Your apparent belief in ‘confidence levels’ trumping error bars and levels is just so wrong SebastianH. so all mitigation measures for it should be scrapped until it is ‘prove’ to be happening. Oh it is happening … but a proof you will never get. This is not mathematics where proofs are indeed possible. There is no evidence of a threat of global warming or any unusual climate change what so ever. Your apparent belief in ‘confidence levels’ trumping error bars and levels is just so wrong SebastianH. Your apparent belief that you are being lied to by climate science is what’s wrong, tomOmason. Stay in wonderland where everything is fine. Have fun. You’ll probably won’t be affected by anything that is happening anyway, in the time you have left on this planet. Oh, so you do have some evidence then? I see poor little seb is STILL at the zero evidence stage. Sliming and slithering in his manic avoidance of trying present evidence to support the very fundamentals of the AGW scam. His utter desperation is obvious in every post he makes. Empty and totally POINTLESS as always. Its not worth arguing with someone you cannot PRODUCE ANY EVIDENCE to back up his/her mindless religious rantings. I’ll come back again in a few months see if he has got out the massive hole he has dug for himself. I love how you mirror everything back to the other side and how that makes you happy (the smiley). Imaginary world it is, only I am not the one living in it, Mr. I-Don’t-Know-how-the-second-is-defined. Nobody tells us what’s really going on even though scientists routinely publish papers that tell us the planet is greening and crop yields are exploding and hurricane and drought and flood and storm frequencies and intensities are stable to declining and coastal land areas are rising all over the world and known species extinctions have not been observed this century and sea ice melt and glacier melt was much more extensive throughout nearly all of the last 10,000 years and 800 million people were lifted out of poverty in China and now India’s citizens are rising from poverty and… Nobody tells us what’s really going on? What do you think is really going on that’s different from what scientists tell us? Nothing makes people suffer and die like poverty, except maybe for selfish arrogant elitists who are often responsible for that poverty in the first place. He just can’t help but lie about it. He paints you (and all legitimate skeptics) as not believing “climate science,” as if ALL climate scientists were true believers, as if the 97% consensus were real. THERE IS NO 97% CONSENSUS! So his straw man argument, that in essence you (we) reject “the science,” is fraudulent. But then, that’s just how SebH rolls. In actual fact, the only “consensus” is that there is no need for alarm. While I messed up that sentence by editing it too often, I don’t believe (there is the word again) that one can misunderstand it like this. It’s not about believing climate science, it is about believing that he is being lied to. The same situation you paint yourself into all the time. The essence is that he feels like he knows better than scientists and goes on and on about how everything is fake/wrong/whatever. You are worse in this department, but nope … not a straw man. Stop trolling … like THAT will ever happen :/ See, I’m feeding you. Here is another fish! “The essence is that he feels like he knows better than scientists…” – SebH, doubling down like a demented weasel. Again with the consensus of scientists argument – lol. It’s not tom0 against “the scientists.” It’s tom0 choosing which scientists to believe, based on which ones he thinks are more correct and honest. How is that a consensus argument, Yonason? You are being weird … very weird. You can find a scientist for whatever oppinion one can up with. The important part is being able to recognize when you are wrong and you guys clearly lack this capability by bordering on being [snip]. When you say “he knows better than scientists,” you are implying that ALL scientists are in agreement, i.e., that there is a “consensus” among them. As to others out to “get all my money,” there’s plenty of evidence for that. And it isn’t just my money they want, it’s everyone’s. And if tens of thousands have to die for them to get rich, well, too bad. You do realize that SO applies to you, don’t you? Kenneth supplies countless scientists, yet you say he’s denying the science and doesn’t believe the scientists. Well, some of them we trust, and some we don’t, but that doesn’t mean we are anti-science. It just means our standards of proof require data, not just so stories. It’s perfectly normal for scientists to disagree. That is, in fact, one aspect of “how science works.” The fact that you don’t seem to know that shows your ignorance. Again you pretend to know what I understand, what I know, and my my life experiences. YOU DO NOT! I was taken-in by the cAGW (like many sceptics) but then I noticed worrying ‘adjustments’ to temperature records to make them fit the CO2 supposition, and then the ‘climatgate’ scandal hit. So stop pretending you know what I think, it make you look like a real je®k (or at least a bigger one). Just to remind you, as here https://notrickszone.com/2017/10/16/recent-co2-climate-sensitivity-estimates-continue-trending-towards-zero/#comment-1232370 , YOU regularly dismiss science and the scientist that wrote papers that Kenneth quote. You casually dismiss them because it goes against you precious cAGW belief, a belief that appears to be so bound to your personality that anything against cAGW seems to upset you personally. Calling views contrary to your own “nonsense” is not substantive. Yes indeed the boot is on the other foot — YOUR foot, as you quite regularly dismiss scientific papers based on observational evidence while trying to imply the climate model’s ‘data’ (as preferred by the UN-IPCC) is somehow superior, and constantly imply that all this climate science is some kind of ‘settled science’. Surely that is all anyone should read from your comments to date, that you are a non-skeptical cAGW true believer and nothing else. Good luck in the coming cooling future of the planet, you may well survive it. still in his empty sad-sack. Look deep within yourself , seb.. you will find that IGNORANCE is your only attribute. NEVER producing any worthwhile EVIDENCE. Again you pretend to know what I understand, what I know, and my my life experiences. YOU DO NOT! I know what I’ve read from you here. I dismiss them for other reasons, as written there … on the other hand you seem to just believe anything as long as it conforms to your views and sounds remotely “skeptical”. Surely that is all anyone should read from your comments to date, that you are a non-skeptical cAGW true believer and nothing else. Nope, that’s you … only you happen to call yourself a skeptic. You believe anything that sounds skeptical has merrit and what climate science actually found out is happening is garbage. I have no idea why someone would behave like that. Oh, stop being silly SebastianH, the quote from a previous post was you casually dismissing science and scientist for no other reason than it runs against your beliefs. 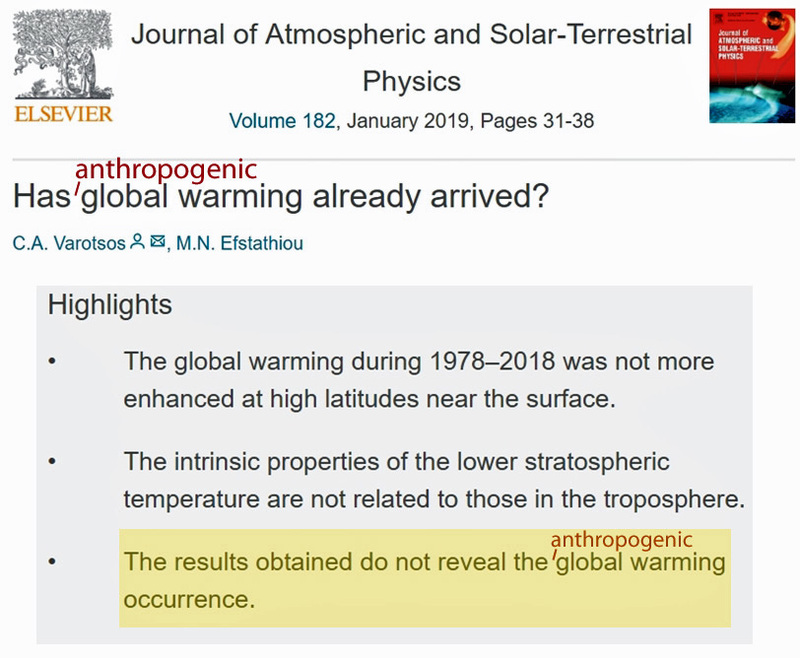 This is not a sign of skepticism but a sign of your very evident bias, your bias is in the belief in the UN-IPCC and all they say. Stop pitch your ridiculous excuses to someone else, I for one do not buy them. Your appear and act just like a cAGW paid activist sent here to play mischief on this blog site. However you still come out with the unsubstantiated as the atmosphere heating the oceans, thousands of species going extinct, and that rising atmospheric CO2 levels will causes significant global warming of the atmosphere. Again, I envy you for your imagination. I am biased towards science. I trust experts. I am skeptic when some guy in the comments of a blog like this expressed wild theories about how the world works or doesn’t work and all he does is point to his “experience”. By the wording of this I suspect you still don’t understand this. Atmosphere heating the oceans? Seriously? That’s what scientists say … we are on the verge of another mass extinction level event if we continue on this path. and that rising atmospheric CO2 levels will causes significant global warming of the atmosphere. Will? This sounds like you still doubt that the GHE is a real thing. If you can’t wrap your head around this basic mechanic how are we to expect that anything you claim here is even remotely connected to reality? And then you have the temerity to believe anyone on this site should take you seriously. No SebastianH, you’re just the entertainment, raising the amusement level here, for which I thank you! Oh, and please find your much advertised observational evidence of atmospheric CO2 causing global warming. Until you do your are just the comic spot on the blog. Do you believe that CO2 has radiative properties, e.g. absorbs and emits radiation at certain wavelengths? Do you trust in instruments that can measure this radiation? If you can answer both with “yes”, then I wonder how you come to the conclusion that there is no GHE or a change in the concentration of the gases making up the GHE doesn’t change the effect. It’s probably the Kenneth fantasy of something not existing until it has been observed in that exact same situation, right? So if I cliam gravity to not exist because it has not been observed in a certain spot in the universe, I’m fine and can tell those pesky gravity proponents that they need to show me evidence first or otherwise I laugh at them … oh and of course I’ll discard everything presented to me as fake if it doesn’t fit my conviction … recognize yourself? Atmosphere heating the oceans? Seriously? The atmosphere’s CO2 concentration has caused 100% of the oceans’ heat increase since the 1950s. Is this not what you (seriously) believe? how [did] you come to the conclusion that … a change in the concentration of the gases making up the GHE doesn’t change the effect. What if trace gas changes actually do change the effect, but by such a small amount that it’s easily overwhelmed by changes in other factors – like cloud cover? Has this been ruled out? If so, when? It’s probably the Kenneth fantasy of something not existing until it has been observed in that exact same situation, right? It’s not a “fantasy” to point out that we have no real-world physical measurements that quantitatively identify the extent to which changes in trace gases cause changes to a water body’s heat content. Gravity, in contrast, is subjected to real-world measurements and quantification. We know, for example, how long it would take a bowling ball and a marble to fall to the surface from a specified height in the same location. We have a quantified cause-effect value with gravity. We don’t with CO2 change–>OHC change. It’s modeled. It’s assumed. It’s not observed. Perhaps one day you will understand why comparing the two is comparing apples to concrete blocks. Gravity’s cause-effect has been observed on Earth. So it’s nothing more than hand-waving to talk about a “certain spot in the universe” for gravity when we’re not talking about certain spots in the universe. We’re talking about Earth. Is someone denying that gravity’s cause-effect has been quantified by real-world physical measurements on Earth? Are you denying that we can measure gravity’s cause-effect measurements on Earth? If so, why? And what’s a “gravity proponent”? And he’s a DENIER of the GRAVITY based thermal gradient that controls the lower atmosphere. The “science” is basically non-existent in little seb. however I do understand that SebastianH is not much more than an avid supporter of cAGW, a mere uneducated sock-puppet and is probably paid to visit here and make all the off color/subject comments. Yes. The only point to countering what he says is to expose his rabid bias and deceit. I certainly have no expectation that anything we say will make the slightest impression on him. We may not always be right, but we’re trying to be, and gladly admit errors and try to correct them. As long as people coming here realize that, and that trolls like SebH are virtually always wrong and thoroughly enjoy it, that’s about the best we can do. Whole lot of faith required to trust that paper, especially when we know the models DON’T agree with the instrument record (as presented by NOAA/NASA after adjustments). Also, while radiosonde and satellite temps agree with each other, they don’t agree with land based readings. But I have to admit, it’s really amazing what “agreement” one can get between a tunable model, and a tunable (adjustable) temperature data base. Let’s see them model this. Why Spencer (a climate scientist) isn’t on board with the scam. Selected heavily adjusted satellite data compared to simulations from selected adjustable WACKY model. Call me when it’s validated against REALITY, ie., it can forecast real climate conditions one to 5 years in advance. This will not, unfortunately, appear in the MSM. It is -11 F outside my door. It will be 20 below zero for an overnight low. A continental climate of Df continues as such. Easy decision to not venture out in the cold today. The winter of 2012-13, the temps reached as low as -29 at night for a good two weeks. It was cold that winter. So far this winter has been milder than most, it seems that way up to this point. It is winter, it is normal weather conditions for this time of year. Cold weather sticks around for several months. It is not climate science to figure out what can happen weatherwise. Let me know when Antarctica is no longer an EF, maybe it’ll warm enough across the entire continent so it won’t have to be an EF anymore. A polar climate never reaches a temperature greater than ten degrees Celsius. Antarctica will probably remain a polar climate for a few thousand more years, if not a hundred or more. Not that it can’t change though, it could. Climate change has to result in actual physical change in the climate. If the ice cap would begin to melt, rainfall on the continent, actual change from what there is there now. Climate change for real. So you set the bar for “climate change is actually happening” to a very high level (let’s call it 100). Why is climate change – in your eyes – not happening when reaching level 10? The ice caps are losing ice mass, the poles don’t need to stay at plus degrees the whole year for climate change to be happening. This seems to be similar as to when people are confronted about the possible future job decline due to artifical intelligence. They think they are safe because no AI could ever do their job to 100%, but all it takes is an AI that does 10% of your job and suddenly 10% you only need 9 people to do the stuff that 10 people did before. You wouldn’t argue that this only becomes a problem at the moment AI replaces what you can do completely, would you? Who has written that “climate change is not happening”? No one, of course. You’ve just fabricated yet another straw man. The climate changes routinely. And there is nothing unusual about the climate changes that have occurred since the 1950s relative to the climate changes that occurred in the past. In fact, if anything, the climate is much colder and extreme weather events less common today compared to past centuries. Oooh. That settles it then. Because ice caps have not lost ice mass before. Therefore, humans caused it. 100% of it. What scintillating logic. Let’s see. Glaciers are receding in some regions of the Earth. CO2 emissions increased while these glaciers receded. Therefore, the CO2 emissions increases caused the ice caps to lose ice. All the proof we need is right there. The science is settled, then. the poles don’t need to stay at plus degrees the whole year for climate change to be happening. Who claimed that the poles need to be at plus degrees the whole year before admitting that the climate changes? This seems to be similar as to when people are confronted about the possible future job decline due to artifical intelligence. Another mindless analogy. I stopped reading after the above line. Hmm, who moderated my reply to this weird Kenneth rage reply which ignores what the OP wrote? I’m replying to your comment. That’s why I blockquote your comment and write underneath it in my reply to your comment. I have no idea why you perpetually and pettily whine about me responding to your individual comments. You don’t understand it’s you and your fellow cAGW congregation that believes is climate stasis. Why would anyone believe 50 or a 100 years ago the climate was better because atmospheric CO2 levels were lower? But that is the IPCC’s and the cAGW’s consensus view! Laughably you (and they) believe that CO2 controls the climate and we must get back to some imaginary number of CO2 molecules in the air so that the planet has a stable climate or we’re all damned. That is the utter madness of SebastianH and his fellow cAGW travelers. Why would anyone believe 50 or a 100 years ago the climate was better because atmospheric CO2 levels were lower? Why should it be necessary to believe such a thing? Why would anyone believe that CO2 and other GHGs don’t have the properties that have been observed? That makes no sense, yet you seem to be on that side of the fence. The beauty of science is that you don’t have to believe it. Warming by increased atmospheric CO2 has NEVER been observed anywhere on the planet. Your comment makes no sense, as usual. Yes, we KNOW you don’t believe in science. I posted these yesterday, but it seems the troll doesn’t believe them. I wonder what part(s) of them, NONE of which agree with the “CO2 causes warming” theory, he doesn’t think is/are “science.” All of which are in direct contradiction to it. Why does he believe that CSIRO is not the science research institute that it is? None of us understand “the science” as well as the troll, who reminds us of it constantly. None of us knows what “scientists” say by him, just ask him and he’ll tell you. Oh dear, oh dear. You really don’t get it. The sun and it’s variations is the rhythmic pulse of our climate and the change in direction it takes. The sun’s pulse is augmented (but never over-ruled) by Luna’s dance, and the Earth’s atmospheric coda of effects, while being modified by the oceans restless tune. And every once in a while there is the rattling percussion of seismic events. All of these marvelous musical patterns each hits their own vibrato of the day and night cycle, to make the ever-changing theme of our climate shimmer chaotically. Overall that is our short term changes in musical theme. Looking at the bigger symphony we see planetary and galactic influence sharpen or flatten the aspects of orchestral tuning over very long timing periods. That is actually a very beautiful analogy, I like it! The change of GHG concentrations would be a gradual change of the key/tone of the symphony then. Believing that gases with radiative properties don’t have an influence on the climate especially when their concentrations change makes you the one who is using his phone on loudspeaker during the concert. Well you have your unverified belief SebastianH. I’m sure as the cool climate creeps on, you, like other deluded cAGW advocates, will not realize it’s the SUN rhythm commanding this planet’s climate tune not some insignificant bit part player of an extremely rare gas. Basically you are advocating that this gas commands the tune when it is just one hair on the bow of a viola within the mass of the string section. It’s important to the viola player but not the determinant of the tune. There is absolutely ZERO EVIDENCE that atmospheric CO2 causes warming. The gravity-thermal gradient RULES in the lower atmosphere. …. but as noted many times, your grasp of basic science and physics is TENUOUS at best. This is fun. Having two delusional blog commenters imagining away on how the world works and insulting those who oppose their nonsense. It’s funny because on the side your fantasy seems to have no limit (coming cooling, gases having no effects, temperature gradients starting at the cold end, etc) and on the other side you lack the imagination of what is possible (gases having effects on the temperature/heat content). Anything substantial to add to these discussions instead of the lousy “climate skeptics” talking points nobody can take seriously? Just his hallucinogenic fantasies, totally unsupportable with any rational science. la-la-land, maybe, because it sure isn’t in any of your posts. ! Seb = SCIENCE FREE ZONE. The Antarctic continent more than likely had an ice cap larger than it is now during the last ice age. Maybe speculation, however, it can be determined by deduction that it probably had greater in mass then than to the current cap that is there today. It has been 800,000 years of accumulation of one inch annual precipitation. The ice cap would be twelve miles thick by now if it didn’t calve and gravity didn’t have an effect. As it is now, the ice cap is over two miles thick in places. The ice cap there waxes and wanes through the sands of time. Climate change was actually happening 18,500 years ago when the Pleistocene ended and the Holocene began. Climate change never stops. Anthropogenic emissions from burning those evil fossil fuels causes something to change, and, no doubt about it, we are here in the Anthropocene. 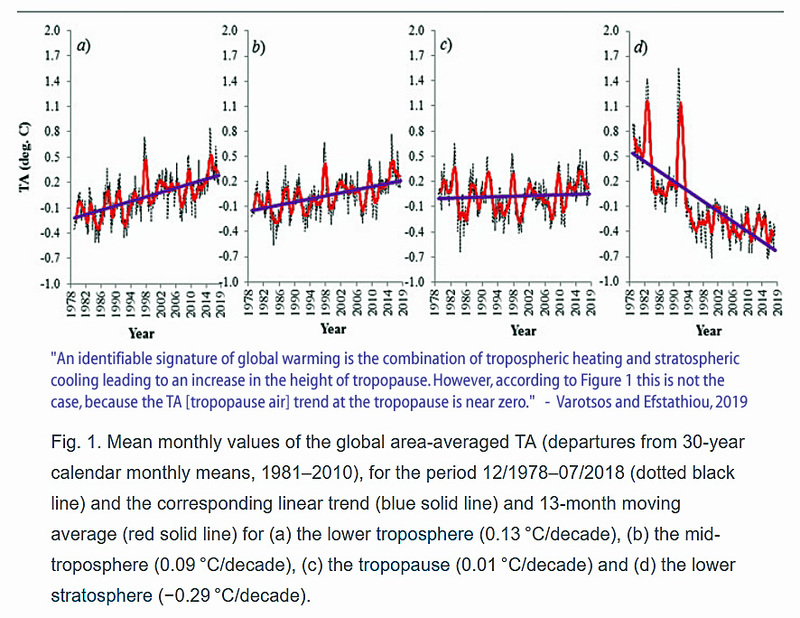 Tropospheric climate change, if you will, began at ten 25,000 years ago, as good a guess as any, then went all the way to now, the number to use is 90. The last 10 is where we are going. The melt is still occuring. The striations in the bedrock in Alberta show the evidence of where ice once was. Landscapesandcycles by Jim Steele has a good grasp on what is actually taking place. It is worth visiting his site to read what is there. Notice this kind of nasty garbage is becoming more common from this pratt. Intolerant of anyone and their ideas if they don’t concur with his own peculiar standpoint. I suspect he would be among the first to push to outlaw diseminating opposing information. Seems to me the makings of a small tyrant here. Pratt … classy. Why is the quoted sentence “nasty garbage” to you? But if you feel better vilifying your opponent and playing the victim, go on! Makes you a better skeptic, I guess. Simple, it is the nasty garbage you are volunteering that clearly makes you a pratt. Maybe if you take your petty sliming attempts elsewhere, you won’t get picked on. You are basically the lowest rung on the ladder of humanity. A fact-free, lonely, pathetic, attention-seeking troll, nothing more. Spike, welcome back, but please refrain from insults and name-calling. wow, the best you can do is pretend its not you looking in the mirror. Not a rational thought of your own, seb. No seb, you are no “opposition”. You can’t even produce evidence of the most basic tenet of the AGW hypothesis. You profess ignorance of the gravity effects, which control the lower atmosphere. You are just a yapping little puppy behind a 6ft fence. Nah, spikey … I don’t need to produce evidence for you that is out there for any rational person to easily find. You’ll discard anything as fake anyways, so why bother? Regarding gravity, as per skeptic logic I am skeptical of the existence of gravity since it has never been observed and measured in that very special spot in an orbit between Mars and Jupiter. Please present these measurements and we can talk about the effect this alleged effect might have on an atmosphere. Why do you hide behind that fence, angry troll? I thought notrickszone abstinence would be a more relaxing experience, yet here you are playing the exact same role as before (I still hope this is not your true self). I am skeptical of the existence of gravity since it has never been observed and measured in that very special spot in an orbit between Mars and Jupiter. For the 48th time, no one is interested in observing and measuring gravity between Mars and Jupiter. All this is is a hand-waving diversion tactic dressed as a straw man (i.e., “I’m using skeptic’s logic”). I will go ahead and delete these we-don’t-know-gravity’s-effect-somewhere-in-the-universe-so-that-means-skeptics-deny-gravity’s-existence-on-Earth inanity from here on out. It’s an obtuse line of argument. And for the 48th time, we do have observed measurements for gravity’s cause-effect relationship for EARTH. Therefore, gravity’s cause-effect is quite different than CO2’s cause-effect on ocean heat for EARTH. Because that’s not been observed. That’s not been measured. Comparing gravity’s cause-effect to CO2–>OHC cause-effect is comparing apples to refrigerators. I am done accommodating these made-up, faux arguments. The latter is very important. He is persistent. Another time SebH made silly comments about gravity I posted this. And I would add that he repeatedly insults anyone who disagrees with his demonstrably false assertions. evasion, evasion….. SO PATHETIC. ! Sceptical of the existence and effects of gravity. Really ??? Go jump of a cliff, then. ! That way you will not be posting any more of your childish, SCIENTIFICALLY EMPTY posts. Your inner DESPERATION at your ineptitude and incapability of producing even the slightest bit of science to back up your mindless religion has turned you mental development backwards.. and it wasn’t going forwards to start with. Even low IQ junior high students can at least TRY to support their position in a discussion. You don’t even try ! That is how pathetic you have become. Sorry Robert but have underestimated, he believes he is so much more than that. It doesn’t matter how many science papers Kenneth show. SebastianH always he believe better and can answer all questions. He even knows how the very structure of the clouds he sits upon operate and their energy balance. However Robert Folkerts, don’t bother taking SebastianH too seriously as he’s just the comedic side show, a detraction from the main topic of the blog post. Though if you can offer more comment that arouse his easily provoked indignation please go ahead as it is great fun to watch him inflate with pomposity. Inflated just like some comedic act ready for the prat-fall that always follows. The early 20th century had the Piltdown Man — a paleoanthropological hoax. The late 20th century has Dr. Michael Mann — a anthropological global warming hoax.